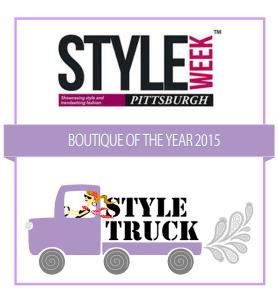 Style Truck is a boutique on wheels, similar to a food truck, but stocked with clothing and accessories for women. We carry many American made items as well as jewelry from local artists. Geared for the woman on the go, our merchandise caters to all ages. Sizes range from xs-xl in most brands. We provide a unique shopping experience by bringing high quality, stylish yet affordable women’s clothing and accessories to your home, business or event. We bring the fashion to you by parking and setting up our shop at venues such as arts and craft shows, festivals and street fairs, home parties, pop up events, corporate and charity functions and fundraisers, office parks and even retirement communities. Host a Party and we’ll truck on over! We are always looking for new events to be a part of or suggestions of where to park. Style Truck, affectionately known as Cookie, is fashioned with a fitting room, shelving and racks inside. Typically, when we are fully set up, a few rolling racks can be found outside. New stock is constantly arriving as we continue to seek unique brands and emerging trends and we always have some sort of sale rack or basket! Find the next Truck Stop and experience personalized shopping in a whole new way! Get Trends & Tips in your inbox!